Today I want to write about an unusual bird that has an important role to play in the environment, the turkey vulture. These large birds have a massive wingspan of almost two metres that enables them to soar high in the air for hours without needing to flap their wings. They have special nostrils, so that from the side, you can see through their beak. This gives them an excellent sense of smell, enabling them to sense dead animals from high up in the sky. Their role in eating carrion is important for the environment as it stops diseases from spreading. When they are attacked, they vomit rotting meat on their attacker, which stinks and stings if it gets in their eyes. At breeding time, turkey vultures don’t build nests, but lay their eggs on a bare surface on a cliff, in a cave or inside a tree. They are the most widespread of all Old World vultures, living in a range of habitats from southern Canada all the way down to the bottom of South America. 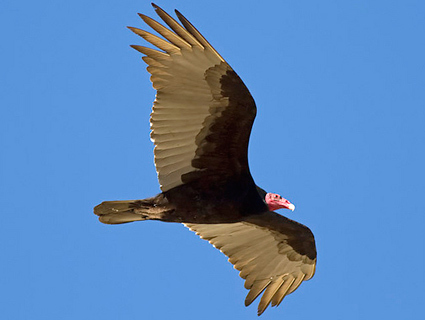 Are there any other interesting facts that you would like to share about turkey vultures? Turkey vultures are super cool! I can’t believe their wingspan is 2 meters long. Great blog Hayden, love all the facts.